These are the weapons of the Colonial Marine Corps. These aren't all of them, only the ones that the Gauntlet has. Treat your weapons kindly, for they are the only thing between you and the slobbering acid for blood killing machine standing in front of you. Take care of your weapons, for they are the only friends you have. A rather aged weapon used often and carried by all Marines, the M4A3 is mainly used against human targets or aliens without a hard exoskeletal armor. The range is approximately 1500 meters, but its maximum effective range is 50 meters. It is rarely used against a xenomorph threat. 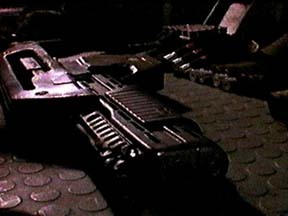 These rapid fire guns are the norm for the Colonial Marines during their missions. The occasion is rare when a Marine does not carry one of these into battle. This gun is rapid fire and holds 99 M309 rounds per magazine. It becomes very easy to run out of ammunition when using these. Also incorporated into this weapon is a PN 30-mm hand pump grenade launcher, which almost always is armed with M40 High Explosive fragmentation rounds, which have an effective range of 400 meters. The M203 PIGs were taken out of commission by the CMC a few years back due to their destructive nature. But now with the tension between the UA and the PNRC, they've been put back on the shelves of the company's stock. 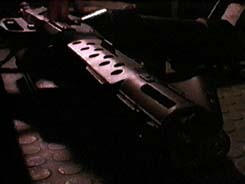 They are a rapid fire assault rifle and fire small M990 Plasma Assault Rounds which explode on penetration. The explode-on-penetration concept is a step above the explode-on-impact concept, as the explode-on-penetration concept causes much more damage. 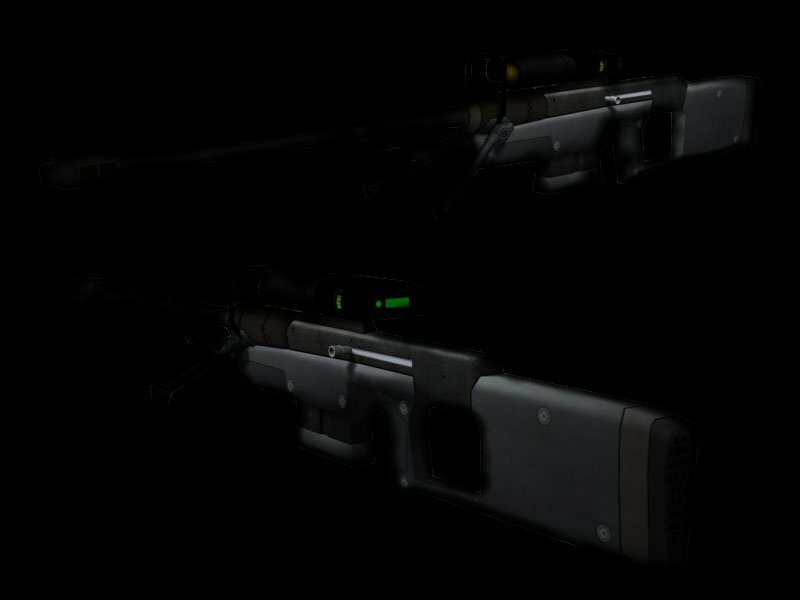 This weapon is the primary sniper weapon of the USCMC. It is usually deployed to one per company, but the Gauntlet carries four. Ammunition consists of one 15 round magazine of M252 HEAP rounds, but M250 rounds are also often used. These huge crane mounted guns are primary offensive and defensive machine. They fire the M250 series round at rapid fire speeds. They have built in IR tracking, which can be converted to movement tracking to aid in enemy location. They do, however, drastically reduce a marine's maneuverability. The 23S Grenade is a small round grenade with a pin on top. The handle supresses the explosion, but not the timer. The timer is set for 12 seconds, if you hold the handle down for 12 seconds then let go, you have an additional 3 seconds to throw it. Use the time wisely. 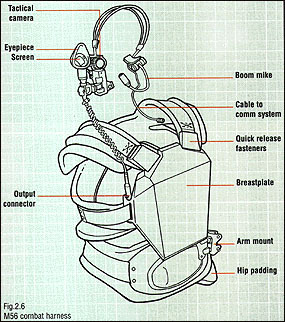 The Teonine Nuclear Grenade is similar to that of nuclear land mines, often used by the US Army. These are still in a prototypical stage and they're only given to the USS Gauntlet's Operating forces Division. These have been guaranteed to protect against radiation poisoning, so Marines won't be hurt during the process of an explosion. TNGs have a relative range of approximately four hundred feet, give or take three inches. After the pin is pulled, the grenade begins a one minute countdown, giving the Marine time to run. TNGs don't pack enough power to destroy a building, but they'll sure as hell blow out the room they were tossed in to. A simple mechanism made by Roderickson Enterprises, these babies shoot out a simple composite Methane gas and ignite it, creating a flame thrower. Not much else to it, the fire is a steady 300 degrees Celsius. Respect it well, because if you turn the gas pressure too low, the flame could manage to travel back into the flame thrower, and explode one hell of a big explosion. (Safety systems were never bothered to be put in.) These weapons are your best defense against aliens, because of the fact that they roast the acid before it reaches you. These weapons also have a blind angle setting, for all the paranoid or precautionary Marines. These remote guns can be programmed to automatically fire at many kinds of target, they areuseful for securing areas. The high caliber projectiles they fire can rapidly decimate an army of approaching enemies. The M5 Grenade System is a 60-mm round with an inpact fused supercritical HEAT warhead. This weapon has an effective range of 400 meters, but a maximum range of 2000 meters. Its primary use is for destroying bunkers and building cornerstones. This weapon is a fully disposable anti-armor weapon which has an effective range of 200 meters. It cannot fire on anything less than 20 meters. Inside the tube, the missile consists of guidance electronics and high powered explosives. This weapon uses an IR seeker to lock onto its taret and destroys it with great accuracy. The HIMAT is a man-portable battlefield 'brilliant' weapon with range of over 5,000 meters. The versatility of the system allows the field commander many options for its deployment and use. This rifle is gas-operated with magnetic propulsion projectiles firing with a velocity of 12 000 meters per second. The rounds are armor-piercing which generates intense heat that allows penetration through many types of armor. The sighting system it employs is a type B56 multiple-mode telescopic sighting system with features that include auto range finding and selectable infrared. This rifle is a gas-operated magazine-fed weapon firing anti-material projectiles. It is issued with several levels of magnification. Low-light amplication can be activated on the scope as well in badly-lit areas. It fires a 14.5mm armor-piercing fin-stabilized discarding sabot. The round can easily over-penetrate its targets. Is made of light weight aluminum alloys, this weapon uses a battery and Power cells that charge the generator that shoots the laser. The weapon has a weight of 5.4 kg. The laser can shoot through light armor some walls and the aliens exoskeleton. This weapon when it hits it also welds/melts the area where the beam passes through causing less acid blood from the exomorph. The weapon when recharging power cells with batteries take about 15 minuets then your ready for action again with a max. effective range of 1500 meters. Now for the Standard Equipment of a Colonial Marine. This is the stuff you'll have throughout ALL of your missions. The standard issue armor of a marine is made of a heavy-duty plastic, able to take a full M309 in the stomach without much damage. (Not that aliens can use M41s...) It was not acid proof originally, but now we have managed to create a somewhat acid proof suit, although enough acid will burn through it. It also comes with head gear, complete with light, radio, handheld welder, and a camera for the commanding officer or whoever is watching to see what's happening. In this small kit every Marine has attached to his/her belt, you will find a large squirty bottle of a standard antiacid. BE WARNED! This base is so strong it could easily do as much damage as the acid, so ONLY apply it to the acid in order to null it, not around the acid area. You also get a spare radio in this kit, in case the other radio becomes broken, as well as some first-aid items. Finally, there is one more thing in the kit. A small vial of Cyanide. What for? If an alien manages to catch you and put you in one of their little cocoons, drink it if possible because it's a much better fate then what's to come. These items measure special types of movement, although the method is not truly understanded by us. It simply broadcasts movement on the screen, and is a VERY important addition to a Marine's arsenal. Because of our small number of movement trackers, only one is given to each team. This Marine dropship is basically a tank with thrusters, as it can withstand an incredible amount of punishment and still function. It is an upgrade from the UD-4H Utility Dropship. It has room for 10 marines, plus another 12 in an APC. It carries 3 Mk. 16 150mm Banshee 70s, which can be armed with the new M680 'cluster' warhead, 4 Mk.10 Zeus', 4 AGM-220c Hellhound IIs, and 5 AIM-90E Headlock missiles. It can also be armed with one 'dry-drop' semi-nuclear bomb. It also carries a full compliment of marines arms and armaments for three days of battle. The dropship is usually piloted by a synthetic for highly dangerous light missions, otherwise it is flown by the commanding pilot. 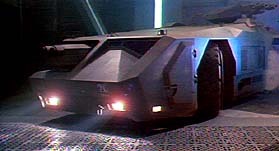 The marine Armoured Personnel Carrier is a marvel of Weyland-Yutani engineering. It is fast,well-armoured and has a Lithium Hydride power source. It can carry a large amount of weapons and up to 12 marines. It has two front mounted Republic Electric RE700 20mm gatling cannons, and a roof-mounted turret that has a 360 degree arc of fire and fires depleted Uranium slugs. It also mounts two 20MeV turboalternator powered charged particle beams.